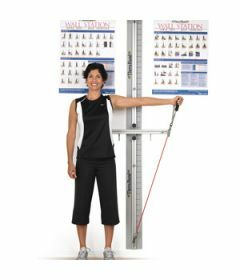 Exercise stations such as the Web Slide and the Web Slide Deluxe by PrePak and the Wall Station by Theraband are designed for physical therapy clinics that incorporate resistance band and tubing exercises in their rehab gym. They are great space savers! The stations are attached permanently to the wall and should be fastened to a structural stud. For Resisistance Exercise Bands go here. For Resisistance Exercise Tubing go here.